Are you one of those who wrinkle your nose, seeing green beans on the dinner plate? 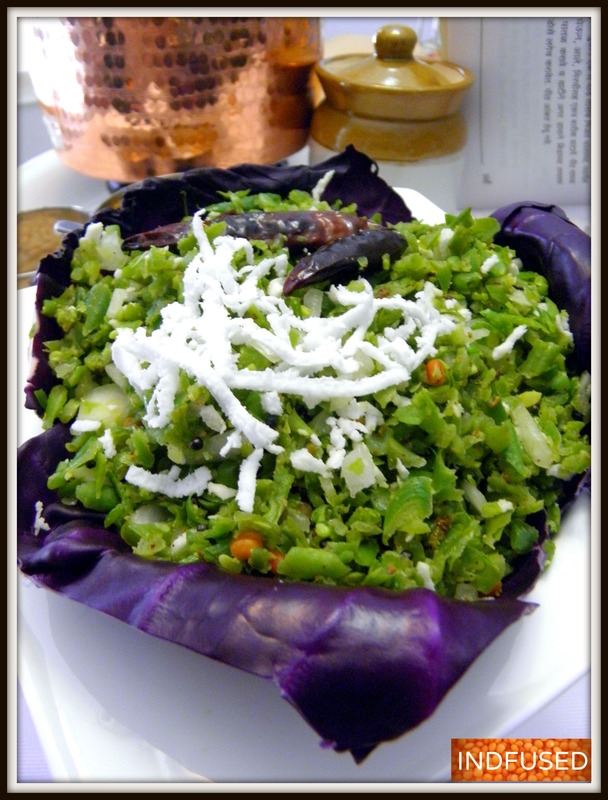 Then this is the recipe that will make you love green beans! How do I know? Because I used to be one of those nose wrinklers:)…. until I ate this Upkari, that is. Ingredients for Upkari being lined up! about 3 cups of fresh green beans, washed and trimmed. 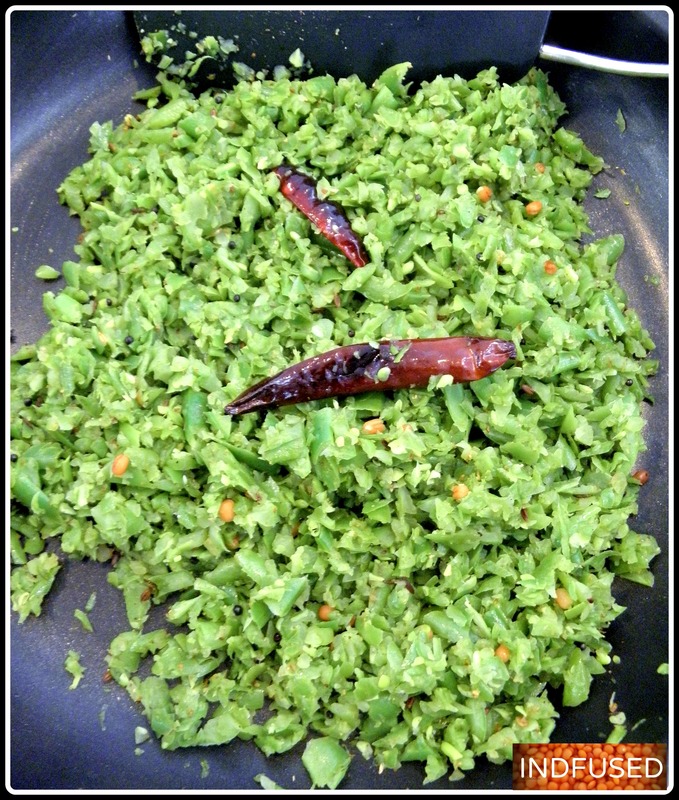 In a food processor, pulse the green beans for a few seconds, in two batches. 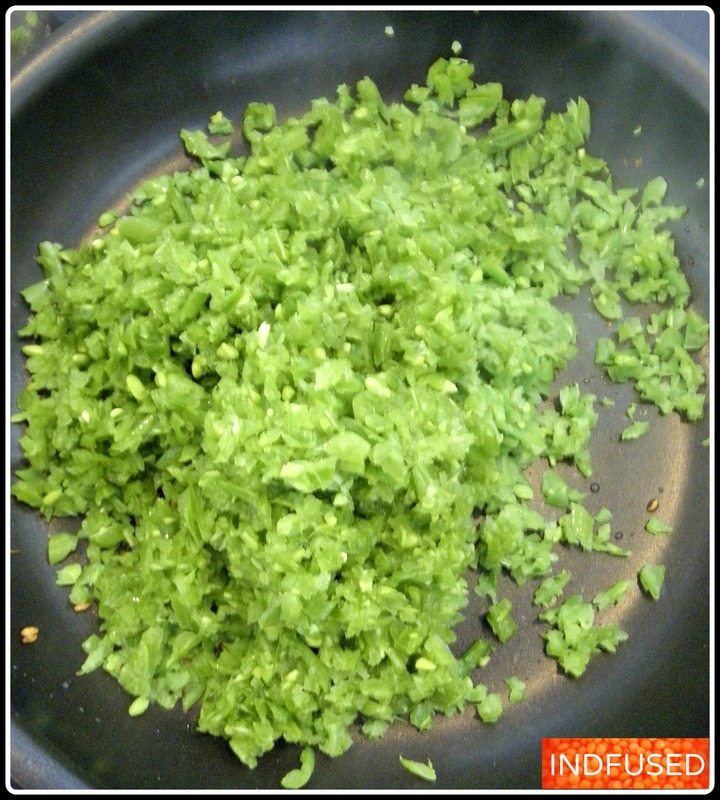 If using a knife, chop the green beans finely. In a frying pan, heat the oil over medium heat. 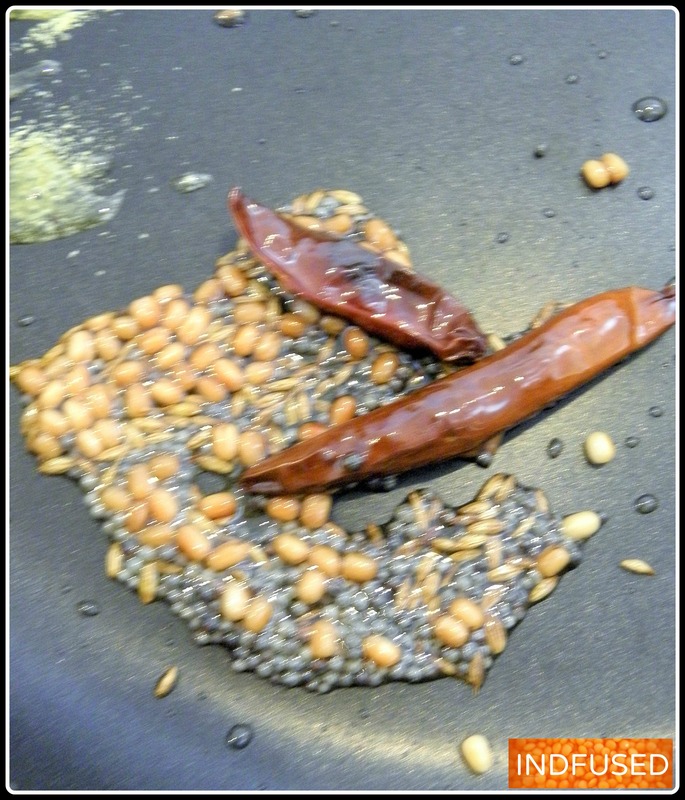 Add the urad dal, red chilies, mustard seeds, cumin seeds and asafetida, in that order. The urad dal will be golden brown, releasing its yummy aroma and the mustard seeds will start to sputter. Turn heat to low. Add the minced/chopped green beans and the sea salt. Stir fry for about 3 to 4 minutes or until the green beans lose their ‘raw’ taste. Add the cumin seed and coriander seed powders and stir fry for another 30 seconds. 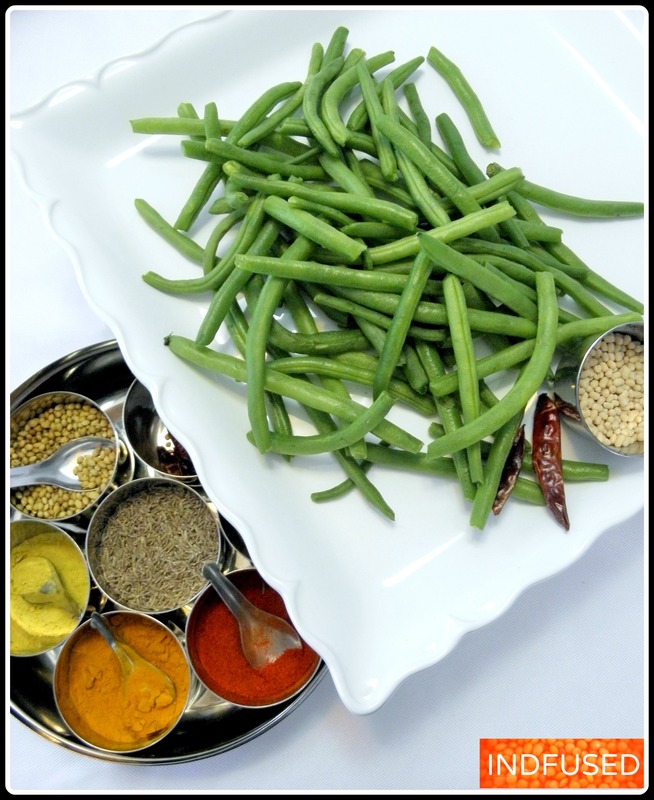 Green beans stir fried with the spices! Remove from heat and let cool. 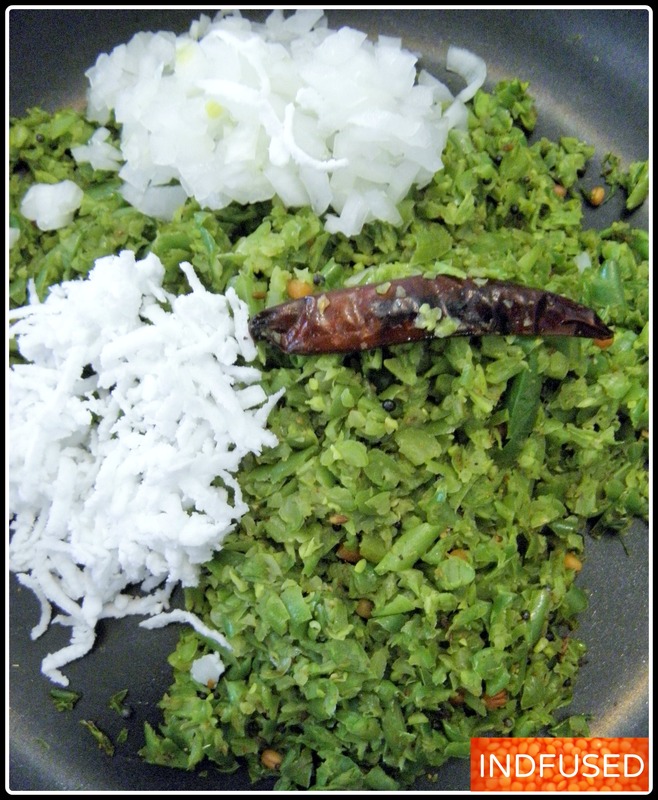 Just before serving, add the finely diced onion and the grated coconut. Toss and serve. The upkari tastes delicious served with parathas and potato curry. Wishing you all a wonderfully healthy Wednesday! Thanks Loretta! Yes I understand the Konkani and some words of the Spanish/Portuguese. I wish I was fluent in it though. I’ve never known of a *minced* green bean recipe before, but now I know I’ll *have* to try this! Sounds delicious!